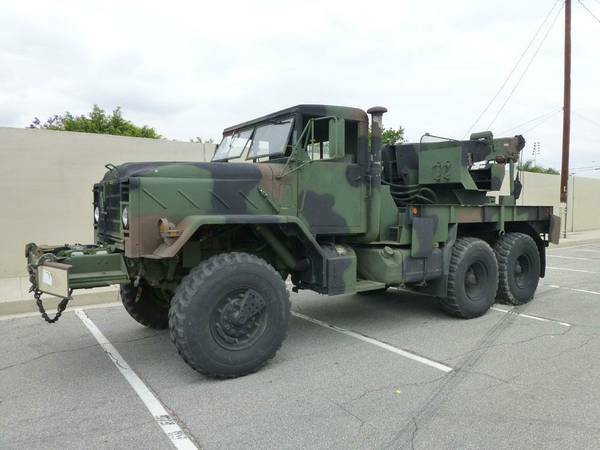 I have a nice low milage Military M936 A2 Wrecker with front hydraulic winch. Cummings C model with Allison automatic. Air brakes. Six wheel drive. Only has 25,000 original miles. Has 45,000lb rear recovery winch with cable layer Front bumper hydraulic winch Has hydraulic boom cable winch Outriggers of all corners Rear boom rotates 360 degrees and extends Just had extensive service with all fluids and filters changed. Many hoses replaced New muffler In great shape with nearly $2500 of new parts. Drives nice. No leaks No rust metal hardtop Dual fuel tanks just been cleaned out New fuel hoses Everything works. Want to build a bug out truck this is your baby. The winch and rotator crane on the back is worth a lot of money. Email me your phone number and I will call you back.